Quite simply, Lake Como is my favorite place on earth. There is no way words can capture the breathtaking moment when you drive over the pass and gaze down at the sun sparkling off the lake like glitter, gently highlighting an ethereal mist hovering over the valley. You lose count of the warm hued stucco and stone villas donning tile roofs nestled along the shoreline, steadily climbing the base of the Alps looming above, eventually just turning into little speckles. All the while palm trees, pine trees, bougainvillea and wisteria draped trellises decorate the landscape so that it somehow seems unreal, like illustrations from a Dr. Seuss Book. About a one hour drive north from Milan you will find Lake Como (or Lago de Como in Italian). It is located in the Lombardy region of northern Italy just minutes from the Swiss border. Lake Como is approximately 30 miles long north to south and is shaped like an upside down letter “Y”, dividing the lake into three legs, with the famous village of Bellagio located directly in the middle of it all. The southwestern leg of the lake is the most populated area with the more villages, extravagant villas and resort hotels than the other areas of the lake, while the northern end of the lake is much less populated and known for water sports such as sailing and windsurfing. At the base of the south western shore you will find the 2000 year old walled city of Como, which is the largest city on the lake and a world famous producer of extravagant silks. Traveling from Como north on the western shore of the southwestern leg you will find the other key villages of Cernobbio and Tremezzo, with Bellagio in the center of it all. Throughout the ages, Lario has hosted famous inventors, artists, world leaders and royalty. If you drive along the lake you will travel over the remnants Via Regina which was created as part of a trade route for the Roman Empire. During the Renaissance period Leonardo de Vinci traveled to the lake for inspiration. Later, Lario would attract poets Byron and Shelley, and leaders like Winston Churchill who would retreat to it’s shores to paint. In 1945 Mussolini and his mistress were captured and killed in the town of Giulino located along the lake as they attempted to flee to Switzerland. In more recent times folks like Gianni Versace, Richard Branson and George Clooney have owned homes on the lake, and and Silvio Berlusconi has likely thrown a few parties in his villa. Royalty and Hollywood glitterati have been vacationing along these romantic promenades for ages, including Price Charles and Princess Dianna, JFK, Marilyn Monroe, and Clark Gable, and more recently visitors like Madonna, Bono, Bruce Springsteen, Matt Damon, Brad Pitt, and Cindy Crawford. I could keep going, but I think you get it, this place is kind of a big deal. Now you have to get here. Milan Malpensa (MXP) is the best airport to access to the northern lake region of Italy. Within an hour of grabbing your suitcase off the carousel, you can be enjoying your first glass of wine at Harry’s Bar in Cernobbio. The train runs directly into the city of Como, but if that is not your final destination you will have to take a ferry or taxi your final destination. I prefer to rent a car so I can navigate have maximum control over my schedule and stop to take a photo whenever I please. You will see signs reading “Car Hire” at the airport, where you can pick up your rental car on-site. Don’t worry, the steering wheel is on the left side, but be sure to ask for an automatic if you aren’t familiar with a standard shifting car. While the major highways are pretty comparable to what we you will find in the US, be prepared for traffic circles, narrow roads and tight switch backs as you near the Alps which can take some getting used to. You could spend a week just lounging lakeside watching the ferries pass you by, or if you are always on the go there are tons of sites to keep you busy. VILLA CARLOTTA: Located in the village of Tremezzo, Villa Carlotta is one the most well known estates on the lake, boasting over 70,000 square meters of gardens that you can tour (word to the wise, don’t take a stroller if you have little ones, the terrain is pretty rugged and full of stairs). Before leaving Tremezzo, also be sure to check out the beautiful promenades of Teresio Olivelli Park (which is free!). Front façade of Villa Carlotta. VILLA BALBIANELLO: Likely the most noteworthy villa on the Lake, you may recognize Villa Balbianello from scenes in Star Wars: Attack of the Clones and Casino Royale, and the charming movie A Month by the Lake depicting the lake in the 1930’s (worth watching for the beautiful scenery alone). Built in 1787 on the site of Franciscan monestary, this villa was a residence of the Vistonti family, but later fell into disrepair until US Official Butler Ames purchased and restored the villa after World War I, and in 1974 it was purchased by explorer Guido Monzino, who furnished it with memorabilia from his expeditions and upon his death left the property to l’Ambiente Italiano (the National Trust of Italy). Today you will find the grounds filled with happy tourists taking photos and it is a popular site for (very expensive) weddings. You can reach the villa by ferry or a rather lengthy hike out onto the peninsula. 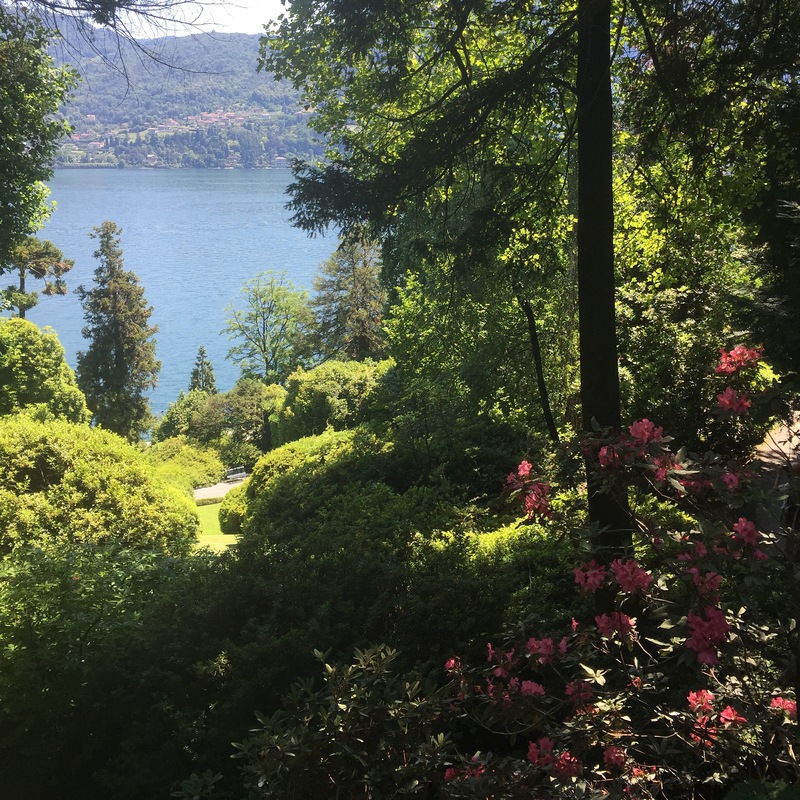 The days of the week and times the Villa Balbianello is open to the public varies each season, so be sure to check the website in advance. CERNOBBIO: Just northwest of the town of Cernobbio, this town dates back to the 12th century and is the gateway to towns on the western shore of the lake. One of the streets through the town is so narrow that traffic only runs one way, and is regulated by a stop light. There are a host of cute shops, some of my favorite restaurants and bars, and yet another beautiful promenade where you can find the perfect bench to scarf down your favorite gelato as you watch the ferries pass by, or perhaps even jump aboard one. 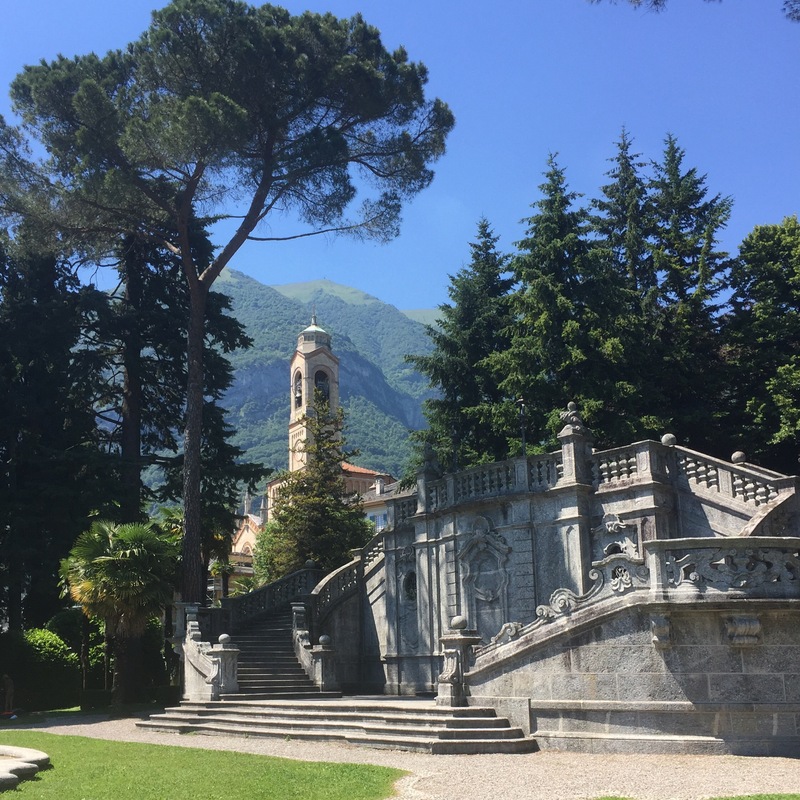 If you have a chance check out beautiful Villa Erba (site of scenes from the movie Ocean’s 12 and Gwen Stefani’s “Cool” video), as well as the stunning Villa d’Este to grab a drink and walk the gardens. Looking up at Cernobbio from the promenade and ferry stop. Harry’s Bar is the middle of the three buildings in this photograph. Looking down at Cernobbio from dinner at El Gatto Nero. BELLAGIO: You will find the shores of the charming town of Bellagio teaming with busy tourists hopping on and off ferries all day, as this is one of the most visited sports on the lake. This is the place to go shopping for your Como silk ties, leather goods, olive wood cutting blocks and Italian art. The streets are fun and winding, but it is also teaming with steep stairs so be wary if you have trouble getting around or are traveling with strollers. I enjoy coming for the afternoon, shopping for a few hours, enjoying a bite to eat and the cheery flowers along the shore. The winding paths of Bellagio. COMO: The town of Como is where the train station is located, and is the most metropolitan city along the lake with the largest population. You can find hotels and reastaurants at slightly more reasonable prices here as well. Perhaps slightly less romantic than it’s cousins along the southwestern shore due to its real city feel, it is only a short ferry ride away from those cozier towns. Take a ride up to Brunate on the Funicular between Como and the hilltop village to catch some stunning views of the alps! VILLA D’ESTE: Located in the town of Cernobbio, Villa D’Este is where celebrities like Springsteen, Madonna and Bono stay when visiting the lake. Originally established as a convent in the 1400’s, this site was converted to a luxury hotel for nobility and the bourgeoisie in 1873. The grounds are stunning with a beautiful stone mosaic as the centerpiece of the gardens, and a swimming pool that is actually floating upon the lake. The rooms typically start somewhere near $1000 a night and go up from there. If that is a bit out of your budget try to stop for dinner or a drink so you can still take in the sites. Beautiful gardens of Villa D’Este. View of the main building at Villa D’Este from the water. GRAND HOTEL TREMEZZO: With a price tag a bit less shocking than Villa D’ Este, Grand Hotel Tremezzo hotel boasts a floating swimming pool from which you can see the shores of Bellagio almost directly across the lake. The hotel is next to Villa Carlotta, and is an easy ferry stop away from several towns. RELAIS VILLA VITTORIA: I love to pretend that I have my very own villa on the lake, and this small hotel makes that very easy. I hesitate to share Relais Villa Vittoria as it has very few rooms, but it is simply perfection. You can eat onsite, or a few nearby restaurants in the town of Laglio, but if you are staying here I suggest that you rent a car to make it easier to get around. It’s only minutes to Cernobbio and Como to the south, and I head north a few miles to the charming town of Argegno to catch the ferry to Bellagio. This has been included as one of Travel and Leasure’s best new small hotels in Italy and its a great deal for the money. Get one of the rooms with a balcony, it is worth it. GRAND HOTEL IMPERIALE: Located in the town of Moltrasio, Grand Hotel Imperiale is in a great location on the southwestern shore just north of Cernobbio. The hotel grounds are pretty big, so be sure so specify when making your reservation if you will be in a lakeside building or across the street with garden views. With onsite restaurants, pool and it’s own diving board into the lake, the onsite amenities are pretty great but be prepared that while clean, the interiors could be updated a bit. The prices here are really reasonable though, especially in summer months, and you can rent your own boat right across the street. OTHERS: While still pretty pricey, the eastern shore of the southwest leg of the lake gets a bit more shade, so you will get a bit more bang for your buck at the upscale Casta Diva and Villa Lario. In addition to the hotels above, if you are traveling with a large group, want a villa of your own, or have little ones and just need a kitchen and some separate bedrooms, there are also a fair number of vacation homes, villas and apartment rentals available online. I think the best time of year to visit is in the summer when you can drink in the sunshine and zip around the lake all day in on a boat, but the crowds and prices understandably increase during that peak season. June can still be a little chilly and tends to be a bit more rainy than July or August. 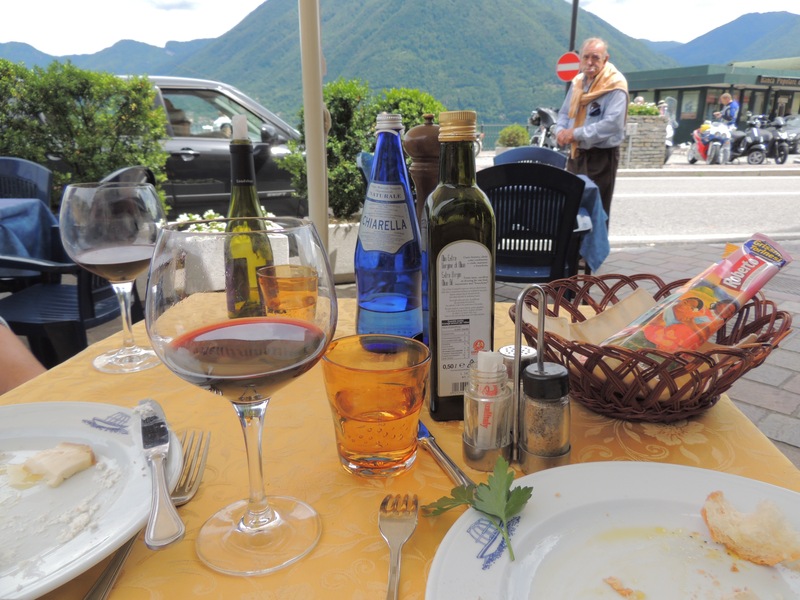 If you are more interested in drinking in your favorite Italian red and exploring the towns, restaurants and shops, the spring and fall seasons are also delightful and much less expense. May and September are great months to visit. While this area is at the foothills of the Alps, it is not a ski area so many hotels, restaurants and bars close down from November through February. Spending a day or days on the lake is a must-do here, and its the best way to see the sites in a short period of time and the only way to truly appreciate the majestic mountains, gardens and villas the decorate the landscape. 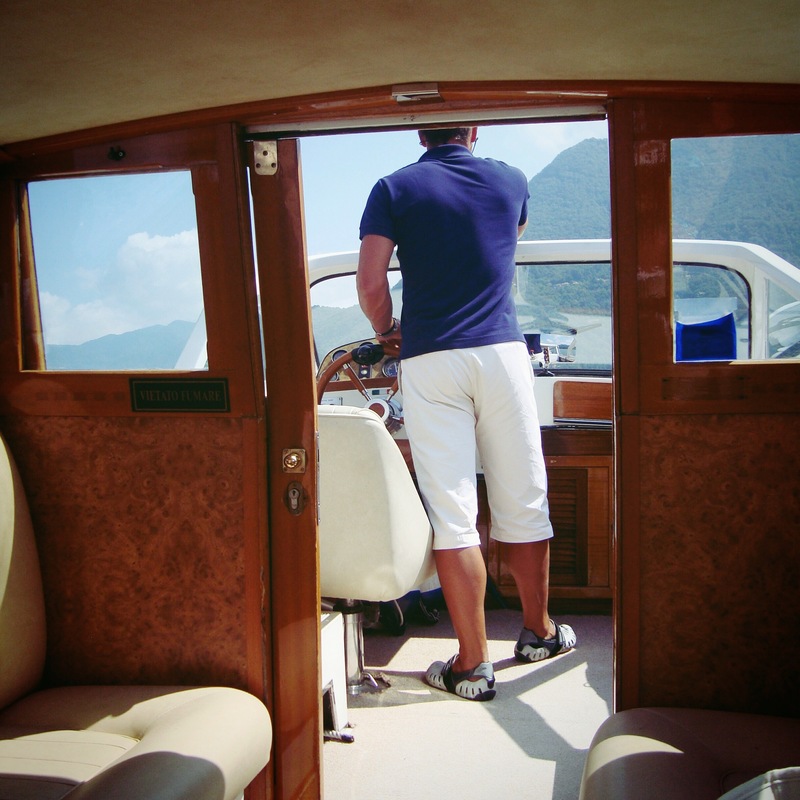 Your three options are (1) travel by ferry, (2) hire a boat with a driver, or (3) rent your own boat by the hour. Navigating the lake via ferry is pretty easy, and each ferry stop will have an up to date brochure with daily schedules. Schedules and the number and location of stops will vary from season to season, so be sure to check before you go. More popular ferry stops are in the towns of Como, Cernobbio, Menaggio, Argegno, Tremezzo and Bellagio, but there are many other smaller stops that operate with less frequency. In some larger locations like Bellagio you can also find car ferries, but those are more limited. If you are trying to catch the last ferry of the day from any stop, get to the port a little early to ensure you have a good seat. When choosing a ferry, keep in mind that there are both slow steamer type ferries (which are more common) and hydrofoil type boats between key ports like Como and Bellagio that are much faster – depending on how far you travel there can be hours difference up and down the lake. Look at the departure times as well as the arrival times at your intended destination to make sure you chose the right boat for you. Most ferries include interior and exterior seating, and I almost always opt for sitting outside so I don’t miss a thing. Many ferries have small cafe’s where you can purchase snacks and coffee, and feel free to bring along a bottle of wine to enjoy along the way (its allowed here). Ferries are by far the most economical way around the lake – you can buy tickets from one stop to the next, round trip tickets, or buy a daily pass for unlimited stops. Your second option is to hire a boat taxi around the lake. Although this can get pretty costly if you aren’t traveling with a larger group that can split the cost, it is something that you should do at least once if you can. Your driver can usually pick you up directly at your lakefront hotel for maximum convenience, and you can tailor the length of your tour and what you’d like to see. The guides will teach you about the history of the lake, who owns which villa, and will take you to see sites like a hidden waterfall in an obscure little nook of the lake. This also allows everyone in your party to enjoy the trip, and have a few cocktails along the way. Check with your hotel and they will likely be happy to help you make arrangements, but I’ve also included a link to one of the companies HERE. This will likely cost you a few hundred dollars for a couple of hours, but once you learn more about the lake you will be ready to hit the lake on your own. David (pronounced Da-Vid). My mom and I were a fan of our boat captain on our girls trip. BIG TIP HERE: Remember to lather on sunscreen during your day on the lake- its easy to forget with the lake breeze cooling you off and the water reflects lots of sunlight! It’s not unheard of to catch a glimpse of George Clooney, Rande Gerber and Cindy Crawford cruising the winding roads surrounding the lake on their Harley’s, although I have yet to be so lucky. With a mild obsession with George Clooney tucked under my belt during my first visit to Lake Como back in 2008, I determined that I would figure out which villa was his. Turns out, Villa Oleander is difficult to locate and every boat captain, car hire or local will happily point it out to anyone who is interested. You can pretty easily snap photos of the stately cream colored villa from your ferry, boat hire or walking past in town, but please be respectful that this is someone’s actual home. Be careful not to hang around too long thinking you may get a shot of the world famous star because (1) I’m pretty sure he’s not going to be walking out his back door if a random person he doesn’t know is lurking awkwardly around outside with a camera in tow (would you? ), and (2) there are actually local ordinances enacted that make loitering in the area surrounding his villa illegal following some pretty terrible paparazzi constantly swarming the area in the summer months. See it, snap a photo if you so choose, and move on by. And don’t worry, you still have a shot bumping into George when you go out to dinner at night, he’s often out and about. HARRY’S BAR: Harry’s Bar is located along the promenade near the ferry stop in the town of Cernobbio. This is a fantastic place to sit and enjoy a nice afternoon drink as you watch kids running down to the nearby park with a melting cone of gelato in their hands. EL GATTO NERO: El Gatto Nero is a do not miss. 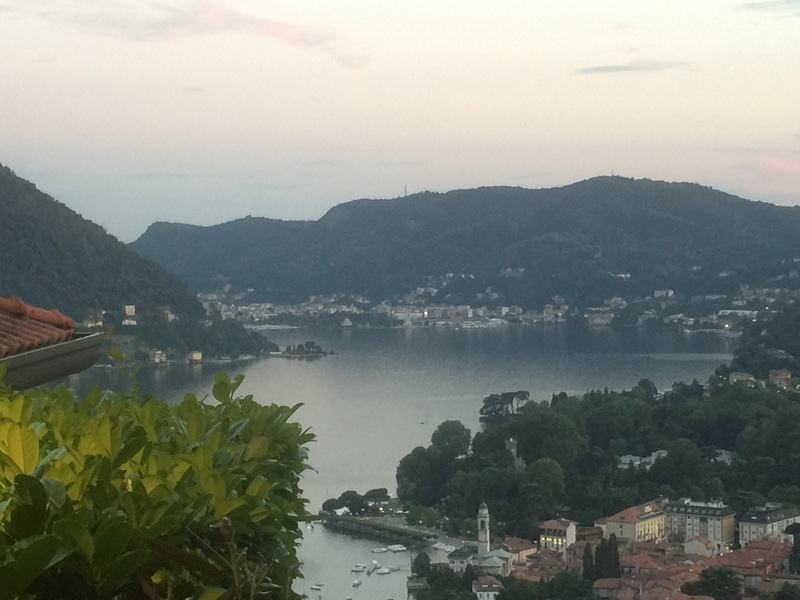 This restaurant is also located about half way up the mountain from the main traffic circle in the town of Cernobbio and it offers the most spectacular views of the lake from high above. The food is as spectacular as the view, and features many fish, fowl and other meat dishes which can be much welcomed after lots of pasta (but their pasta is great too!). Be sure to call ahead for a reservation. BIG TIP HERE: El Gatto Nero is one place where I’d recommend hiring a driver or taxi for dinner. You will be driving up some crazy switchbacks until you reach the restaurant, at which time a guy in a car will greet you and zoom up the mountain instructing you to follow him. You will chase him up the mountain in the car until he instructs you where to parallel park in a teeny space along cliff with low stone walls on the one way road, and then wait to drive you back down the mountain to the restaurant. Basically think valet parking but you park your own car. In any event, you will spend most of dinner thinking about how you will squeeze out of the impossible space on the cliff, find a place to do a 3 point turn on the one way switch back road, and make it back down the mountain… HIRE A DRIVER! Your hotel will be more than happy to call for the reservation and driver, and you won’t be sorry. GIARDINO CERNOBBIO: If you want something more low key with fantastic pizza right on the main drag in Cernobbio, try Giardino Cernobbio. Giardino’s happily accommodating our son Max when he was 8 months old for dinner. Italians love babies and will happily host even the crankiest of little ones graciously! I have dreams about this pasta. I was told it was out of season when we visited last year in June and was so bummed! I have had it in August in September, but other than that I have no idea when “in-season” is. Best pasta I will likely ever have. Pretty town of Argegno, slightly less touristy than many. One of my favorites on the lake. View from my balcony at the Villa Vittoria in Laglio. Looking out onto the lake from the Villa Regina Teodolinda in Laglio. What a phenomenal article! You make me want to go to Lake Como tomorrow! Definitely will add to my bucket travel list. You are a fantastic writer and I found this very helpful and an awesome guide for traveling there. Thank you Jess! You guys have to go sometime! We took max last year when he was 8 months old and had a great time. It’s only an hour from the airport and they love babies! !